How do you tell someone you love them when they don’t even know you are there ? How can you show them you care? 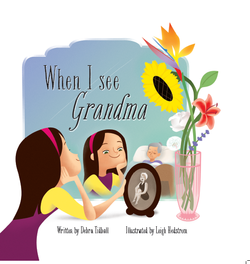 When I See Grandma captures the dilemma many children face when those they love are withdrawn, like the Grandmother in this book, and offers them a way to connect. It transports children from being passive onlookers in an overwhelming setting to active agents for transformation. Two children visit their unresponsive grandmother in an aged care home and ‘brighten her dreams’ as the reader gains an insight into Grandma’s past, linking her past to the present. The bleakness of the setting is transformed by the children’s vitality that brightens the lives of the residents. And the children make memories they will treasure forever whilst helping Grandma remember. You can buy When I see Grandma direct from the Wombat Books website or your favourite bookseller - in-store or online. It is also available as an eBook from amazon.com. “Debra and Leigh have done a lovely job of conveying grandma’s integrity and humanity although she can no longer interact with her grand daughter. The whole feel is so gentle and uplifting.” Teacher librarian. “This is a joyful and poignant celebration of life and love, and I am delighted that Debra Tidball has decided to donate all her royalties to the Hazel Hawke Alzheimer’s Research and Care fund.” Sue Pieters-Hawke. When I See Grandma is beautifully and lyrically written, delightfully illustrated and a joy to read to your child. It will open a window into the past, help you make memories in the present and give you hope in the future. And even more – it will provide much needed funds for Alzheimer’s research and care via Hazel Hawke’s fund. It's a beautiful book, with such a depth of love, longing and memory. Perhaps it was because it's only a few weeks since I was visiting my own Grandma to say goodbye, but the last page made my heart cry. I don't think children would feel this way unless they needed to, and that - my friends - is the absolute wonder of a great kids book! This marvelous book is written for children but has so much to say to adults too. Written about a bedridden older woman, it reminds us that people are so much more than what we see at a particular point in time. Well worth buying. - Rev. Sue Willis. It is so gentle and loving in its message, and yet at the same time so compelling and thought provoking. The final words and illustrations left me with a profound mix of peace, sadness and, overwhelmingly, joy. Leigh's illustrations are so perceptive, both tender and humorous, and connect in a remarkable way with the text. - Margaret Grainger, reader.